Director Matthew Herrick had his first stage experience as a seven-year-old soprano in the SCERA Boys Choir. He volunteered at the movie theater, was an administrative office assistant, and later appeared onstage as an actor at the SCERA Shell Outdoor Theatre. His love for SCERA runs deep. His early experience with SCERA helped launch Herrick’s lifelong love of the arts and a career as a multi-faceted performer, director, music director and educator on the national level. He formerly taught at New York University, University of Northern Colorado, and The University of Texas at Austin, and his own private studio in Times Square, NYC. He received a Master of Fine Arts in Acting from The University of Texas at Austin, and a BFA in Musical Theatre from Brigham Young University. His expertise, combined with his academic experience, led him back to his hometown when Utah Valley University offered him a tenured faculty position as an Associate Professor of Musical Theatre. He was selected from a country-wide search and is thrilled to return to his early roots. While Herrick has been heavily involved in a weeklong celebration of UVU’s new Noorda Center for the Performing Arts, he has given 100% to directing and music directing SCERA’s final show of their Indoor Season, Elton John and Tim Rice’s “Aida.” The sweeping pop rock adaptation of the classic story will be performed April 12-May 4 on Mondays, Thursdays, Fridays and Saturdays at 7:30 p.m. at SCERA Center for the Arts, 745 South State, Orem. That can be a challenge in Utah County, but Herrick contacted every organization and community of color in Utah he could identify to encourage people to audition. More than 140 people auditioned, and from there, he was able to reach 50 percent of his goal, including strong leads. 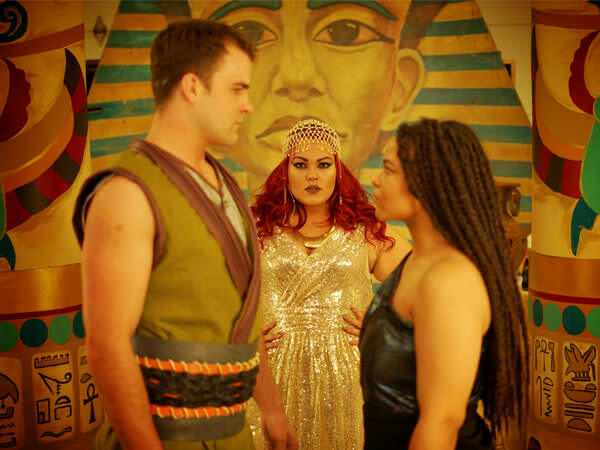 Jalyn Macedone is playing Aida; Tyson Wright is Radames; Beatriz Melo is Amneris; Kyle Baugh is Zoser; and Kiirt Banks is Mereb. The team includes M’Liss Tolman, scenic designer; Elizabeth Griffiths, lighting designer; Kelsey Seaver, costume designer; Christy Norton, props designer; and Chase Elison, sound designer. Reserved seat tickets are $14 for adults and $12 for children age 3-11 and seniors age 65 and older. Tickets are available at www.scera.org, by calling 801-225-ARTS, or in person at the main office at SCERA Center, open 10:00 a.m. to 6:00 p.m. Monday through Friday. McKenna is the Marketing Specialist for Explore Utah Valley.